Beechdrops (Epifagus Virginiana) other name : Caner Root. Epifagus virginiana is an annually growing parasitic plant that was first discovered in Virginia, United States. Beechdrops are small plants usually growing to a height of anything between 4 inches and 18 inches and generally do not have any branch. However, the larger plants of this species have branches that are arranged in panicles (paniculate), which appear on firm rising stems. 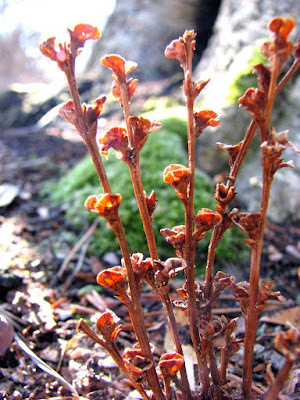 Initially, these stems of Beechdrops have a cream or tan hue or may even be purple-striped, but the color changes to brown as the plants mature. The branches do not have any hair on their surface and are smooth. However, occasionally, they are somewhat pubescent or covered with fine short hair. The leaves of Beechdrops are reduced to insignificant scales and they appear just under some flowers. The flowers of Beechdrops emerge alternately along the length of the stems. The flowers on the lower part of the stem are cleistogamous (possessing the ability to self-fertile), while those on the upper part of the stem are perfect blooms, which are generally sterile. The cleistogamous or self-fertile flowers are diminutive and are shaped like buds. On the other hand, the perfect flowers on the upper stem include tubular corollas having small calyces. The corolla of the flowers on the upper stem is approximately one-third inch (8mm) long and has a creamy purple hue with four small lobes beside the external rim. The calyx of beechdrops is cream-colored having five purple-striped teeth. Compared to the corolla, the calyx of the perfect beechdrops flower is much short. Every flower of beechdrops contains a solitary style, in addition to four stamens, which are concealed inside the corolla. The plants bloom during the period between the later parts of summer and the fall (between August and October). The flowers of Beechdrops do not have any conspicuous fragrance. All the fertile flowers develop into a tiny oval seed capsule measuring roughly one-fourth inch (6 mm) in length. The seed pod encloses many petite seeds, which are so light that they are carried by the wind. The root of beechdrops is fibrous. Occasionally, you can find the plants forming large colonies. The firm ascending stems of beechdrops have a pale brown hue with purple bands that turn darker as the plants mature. The insignificant leaves of this species are vestigial and almost invisible - they are commonly called scales. The flowers grow up to a length of half an inch (1.3 cm) and are tubular, at times having square edges. The flowers bloom alternately the length of the stems and found in a blend of either deep red and purple or white and yellow. When you look at the flowers of Beechdrops from some distance, their color appears to be brownish, intermingling with the color of the stems. This is the reason why people often overlook these flowers of Beechdrops. It is interesting to note that beechdrops do not have proper leaves as well as chlorophyll. This makes the plant a parasite, depending on other plants for its nutrients. Even the small flowers of Beechdrops are so insignificant that it is difficult to distinguish them from the remaining plant. Beechdrops produces two types of flowers - cleistogamous (self-fertile) or chasmogamous (allowing cross-pollination when the flowers are open). The chasmogamous flowers appear close to the tips of the inflexible stems, while the cleistogamous flowers appear near the base of the stems. The genus name of this herb which has been derived from two Greek words epi (meaning upon) and phagos (denoting beech) implies that this species is generally found growing below the beech trees (botanical name Fagus grandifolia). This species thrives by drawing its nourishment from the beech tree roots. The flowers of Beechdrops are marked delicately and it is definitely worth taking a close look at them using a hand-held lens. Often, the dried out stalks of beechdrops are found lying under the beech trees throughout the winter months. The plants growing in the northern hemisphere bloom during the period between August and October. As beechdrops is a parasitic plant, it should always be grown close to the beech trees - its host plant, which provides it all the necessary nourishments. As mentioned earlier when the plant dies and its stems dry out, Beechdrops is found scattered beneath the beech trees all through winter to the subsequent summer. Even when the beechdrops plant is in bloom, it appears to be dead when you look at it from some distance. Beechdrops seems to be a drawn out hand of a human skeleton that has stirred up from the ground. However, when you examine it from close quarters, you will find it to be an interesting plant having attractive flowers having creamy and purple stripes and same colored stems. 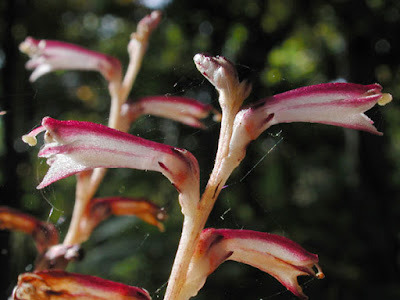 Beechdrops belongs to the Broomrape family (Orobanchaceae), a small cluster of parasitic plants. This plant family also includes other parasitic plants that have a propensity to have stouter stems and are less branched compared to the beechdrops. These plants produce comparatively large flowers having the same type of tubular corollas, whose length is usually more than 1/2 inch. However, these plants do not compete with beechdrops directly, as though they are also parasitic, they count on the roots of other plants and not the American beech. Usually, these parasitic plants are hosted by oak trees and a wide range of plants belonging to the Aster family. Beechdrops is an annually growing parasitic plant that does not have any chlorophyll and survives by obtaining the necessary nutrients from the American beech trees (Fagus grandifolia). It is impossible for beechdrops to survive without the existence of the beech trees. Beechdrops is always found growing underneath this tree. This parasitic species thrives excellently in moist thickets and woodlands. Beechdrops has a number of therapeutic uses. Beechdrops possesses astringent attributes, Beechdrops is generally employed externally to heal cuts, bruises, wounds, and even skin irritation. In North America, the native Indians have been using the beechdrops for treating a number of health conditions like diarrhea, dysentery, cold sores and mouth sores. People who have been suffering from hemorrhages or bleedings of the uterus or bowels as well as diarrhea have found this herb useful in treating these conditions. Although some people claim that beechdrops is helpful in treating cancer, there is no scientific evidence that the plant possesses any such attributes. A decoction prepared from the herb is consumed generously for treating erysipelas (a severe infectious skin disease, characterized by headache, fever and vomiting). This decoction is also used to rinse the affected areas and is proven to be effective for this condition. When applied locally in the form of a decoction or poultice, beechdrops helps to stop or prevent gangrenes when applied topically to wounds, and ulcers. A poultice prepared with equal proportions of beechdrops, white oak and poke is said to be extremely effective in treating herpetic affections. Beechdrops is also effective when applied externally to persistent ulcers, leucorrhoea, aphthous ulcerations (recurrent round or oval ulcers inside the mouth), gleet (pus and mucus discharge) and similar conditions. Homeopathic physicians recommend this herb for treating headaches caused by exhaustion and long journeys. It has been found that this parasitic plant has some effect on the capillary system, something akin to what is produced when the tincture of chloride of iron is used. If taken in powdered form, the standard dosage of beechdrops is anything between 10 and 15 grains. The decoction prepared from Beechdrops may be consumed freely. 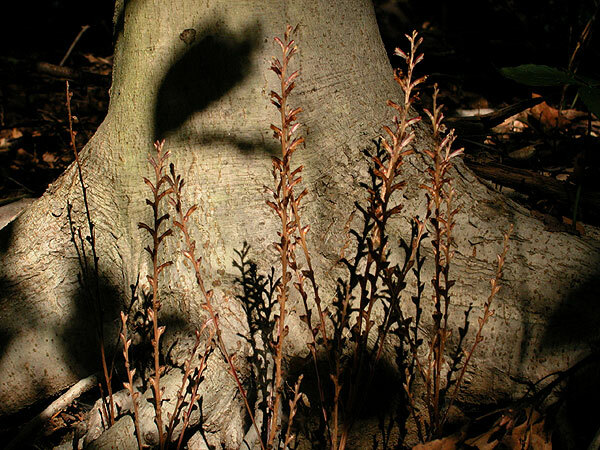 Beechdrops is a parasitic plant found growing on the roots of the American beech. Beechdrops has a bitter, sickening and astringent taste, which decreases greatly when the herb is dried out. Beechdrops is used internally for treating conditions related to the bowel. Beechdrops is also effective in arresting gangrene when applied locally to ulcers or wounds.